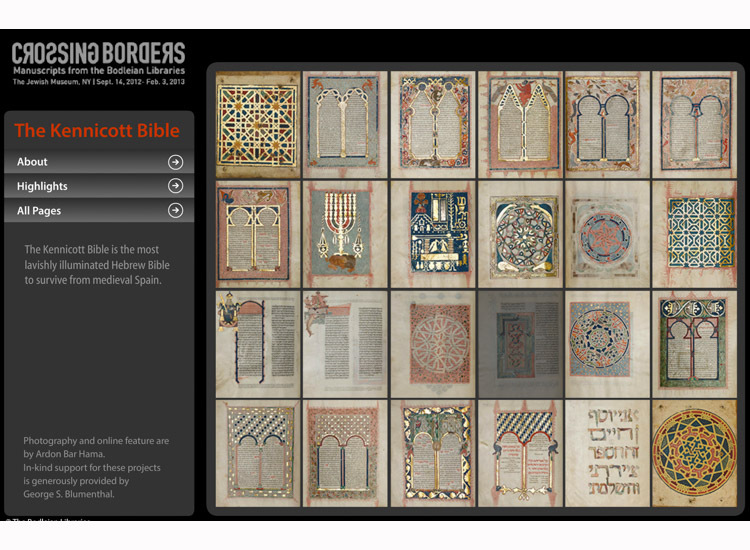 The Kennicott Bible is the most lavishly illuminated Hebrew Bible to survive from medieval Spain. From its inception the manuscript was planned as a lavish work illuminated with burnished gold and silver leaf. The highly stylized figures with their rich colors bear witness to the close co-operation between the scribe, the artist and the patron.The scribe, Moses ibn Zabara, copied the biblical text along with Rabbi David Kimchi’s grammatical treatise Sefer Mikhlol and the manuscript was illuminated by Joseph Ibn Hayyim in 1476 in La Coruña. The Bible owes its name to the English Hebraist Benjamin Kennicott (1718-1783), who acquired it while Librarian of the Radcliffe Library, Oxford. The rich details of the illuminations and the elaborate calligraphy can be viewed by the public thanks to Ardon Bar-Hama’s high resolution photographs.